On 11th November 2018 Poland will celebrate the 100th anniversary of regaining its independence. The month of November will bring the culmination of the whole year of preparations for this important anniversary. 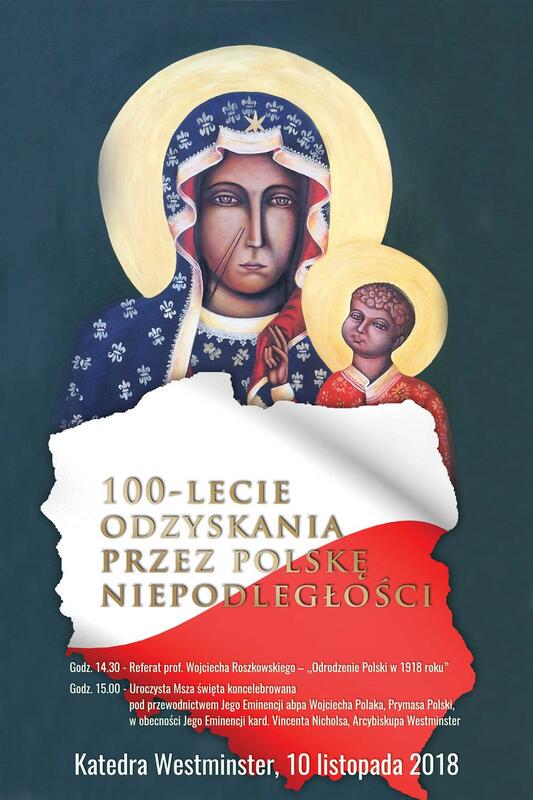 On 9th November the Polish Embassy in cooperation with the School of Slavonic and East European Studies organises a full-day international conference “Poland Restored, Regained and Reborn: One Hundred Years Later” at the University College London. The list of speakers includes leading Polish and British researchers. Opening speeches will be given by Prof. Diane Koenker, Ambassador Prof. Arkady Rzegocki and Prof. Richard Butterwick-Pawlikowski. On the eve of Poland’s Independence Day, 10th November, a special lecture entitled “Rebirth of Poland in 1918” will be given by Prof. Wojciech Roszkowski at 2.30pm. A Jubilee Mass at the Westminster Cathedral, celebrated by the Primate of Poland Wojciech Polak, will follow the lecture. Ambassador Arkady Rzegocki is going to participate in the Mass. The Embassy is happy to announce that two discussion panels on the role of women in regaining Polish independence and on the modern meaning of independence will that place at Old Divinity School, St John’s College, Cambridge on 15th November. This will be a discussion of experts on the subject: Minister Magdalena Gawin, Danuta Huebner, Lena Kolarska-Bobińska, Jakub Majmurek, Bartłomiej Radziejewski, Krzysztof Szczęsny and Agata Szczęśniak. The panels will be moderated by Jakub Krupa (Polish Press Agency) and Annabelle Chapman (The Economist). The event is hosted by Stanley Bill and Simon Szreter from Cambridge University. In November there will be four key musical events to commemorate the centennial anniversary of the independence of Poland. On 11th November (Independence Day) the concert of Henryk Górecki’s “Symphony of Sorrowful Songs” will take place at Southbank Centre at noon. Krzysztof Penderecki’s “Fanfare for orchestra” will be performed in the UK for the first time. In the evening (6.30pm) of the Independence Day, “Sto lat” concert will take place at the Royal Albert Hall. The event, hosted by Kasia Madera (BBC) and Grażyna Torbicka, will be an opportunity to some of the greatest Polish musicians such as Edyta Górniak, Anna Maria Jopek, Stanisław Sojka, Lombard, Leszek Możdżer and many others. The Polish Ambassador will join as a honorary guest. Another musical celebration will be Roxanna Panufnik’s “Faithful Journey – A Mass for Poland” concert at the CBSO Birmingham at 7.30pm on 21st November. This is going to be a UK premiere of Roxanna Panufnik’s composition. The last planned event is The Chopin and Paderewski Gala concert in London’s Guidhall starting at 6pm on 26th November. The evening itself will consist of a reception and concert for over 400 guests. The pianists will be Krzysztof Książek and his wife Agnieszka Zahaczewska-Książek who will perform the works by Chopin and Paderewski. The Gala will be attended by Ambassador Arkady Rzegocki himself. Additionally, it is worth mentioning the on-going campaign to promote Polish poetry on the London’s Underground between 5th and 18th November. It is an initiative of Polish Book Institute (Instytut Książki) which is supported by the Embassy of Poland in London. We hope that these events will be enjoyed by a wide audience and that they will contribute to joyful celebrations of one of the most important anniversaries in the recent history of Poland. Poland’s restoration of independence in 1918 has a profound meaning for the Poles. In 1795 Polish-Lithuanian Commonwealth was partitioned by three absolutist monarchies: Russia, Prussia and Austria. It constituted an unprecedented event in the history of modern Europe – a great country with its liberties, religious tolerance, and more than 400 years of constitutional traditions, disappeared from the map of the continent. In 1918 Poland was restored as a nation-state only to face new aggression from Nazi Germany and the Soviet Union in September 1939. Poles have hence defended themselves against two totalitarian regimes. The non-violent Solidarity movement, born in Poland in 1980, had a significant impact on the collapse of communism in Eastern Bloc. Today, Poland experiences dynamic growth, drawing from its best traditions of freedom and solidarity. Follow us on Facebook and Twitter to find out more about the events.